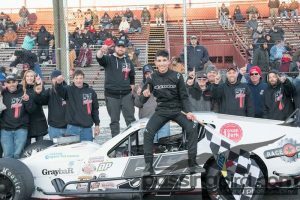 Jonathan Puleo started the 2018 SK Lite Modified season at the New London-Waterford Speedbowl with modest goals. Something happened on opening weekend, however, to upgrade that philosophy. Puleo started on the pole and held off Brett Gonyaw and Wayne Burroughs Jr. to win his first ever SK Lite feature. It was a totally unexpected accomplishment, considering it was his first race after coming up from the Legends division. Puleo didn’t wake up from that dream until the final race of the season. He rallied from an early wreck at the Finale to finish second and win the title by four points over Burroughs. “My team definitely won the championship for me,” said Puleo, who at 15, became the youngest SK Lite champ in the history of the division. Puleo had raced in the Legends division for the previous two years and had one victory. His dad, former Speedbowl champ Ed Puleo, felt it was time to move up into an SK Lite. Puleo wasted no time proving that his dad made the right call by winning at the season-opening Blastoff. That opening win was a game-changer. He didn’t stop winning. He struck again on June 8 when he took lead with an outside pass against John Sullivan on a green-white checker finish. He topped it again on June 15 when he pulled away from Burroughs with five laps to go. The winning streak came to an end, however, two weeks later when Steven Chapman, in his first ever SK Lite race, got by Gonyaw and Puleo to secure the win. Puleo used that extra speed on July 20 when he galloped past Keith Caruso in turn 3 on lap 13 to grab win No. 4. Then Puleo developed another problem. Burroughs started winning races and vaulted into the point lead. Burroughs, a two-time Speedbowl Mini Stock champ, notched his first win on July 29. Then Burroughs topped Puleo by a third of a car length for his second win on Aug. 24 to take over the point lead. Puleo bounced back on Sept. 28, grabbing win No. 5 by charging past Burroughs late in the race. Puleo won again on Oct. 6 for win No. 6, and led Burroughs by seven points heading into the final race of the season. Disaster struck early, however, at the finale. While Burroughs catapulted into the lead, Puleo was involved in a lap 2 wreck and had to go to the pits. When he returned, he was at the rear of the field. Puleo romped his way through traffic and moved all the way to second to nip Burroughs by four points in the final standings. Burroughs won the final battle, but Puleo won the season-long war. His sponsors include Mr. Rooter, Race Choice, Tick Mike, Big A Auto Parts of North Branford, Honest John’s Used Cars, Critical Signs, Hamilton Market, Greybar Electric, Foxon Park Beverages, Hocon Industrial Gas, Race Dog Photography, Wadell Communications and Keith Rocco Racing. 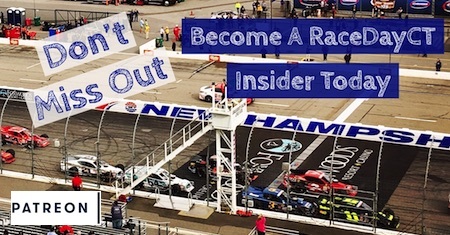 The members of his team include his dad, Steve Godfrey, his uncle Glen, Carl, his spotter Steve, Matt Crowley, Vinnie, Tyler and the entire Vo-Jan race team. Next season Puleo plans to run the 23-race schedule at Stafford Motor Speedway, plus selected races at Waterford and Thompson. But first will come a championship celebration Saturday at the “Stars of the Speedbowl” Banquet at the Mystic Marriott. “This championship means everything,” Puleo said. He started the season just wanting to finish races. He ended the season, however, by winning them. Two of the best people you’ll ever meet ..